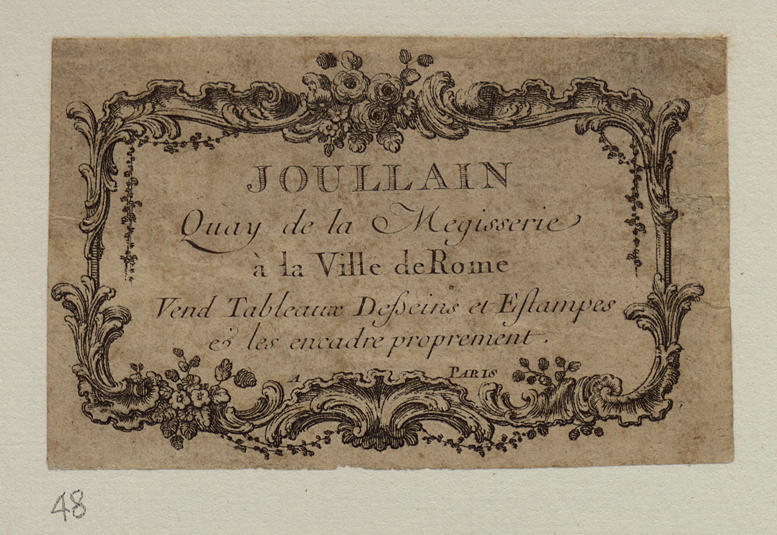 Trade card of Joullain, art dealer, At the City of Rome. The image is etched and the text is engraved; the capitals in the first line of text are decorated with parallel lines. The design consists of a rectangular non-symmetrical cartouche composed of rocaille forms and leaf scrolls which frames the text. At the upper centre of the cartouche appears an arrangement of roses and primroses. Thin vines are draped in the upper corners and along the lower edge. A primrose plant sprouts from the cartouche at lower left. The paper is difficult to identify, it may be thick laid paper or wove. Father and son both worked from this address. Joullain the younger sold paintings, drawings and prints, his father just sold prints, see Le Brun in Related documentation. According to Preaud, Joullain fils was set up in a framing business by his parents in 1757. He was director of the Académie de Saint Luc in 1772 and was often consulted as an expert in painting sales. Joullain the elder published a catalogue of his shop in 1760. For another copy see 3686.1.68.128. Acquired by Baron Ferdinand de Rothschild (b.1839, d.1898) before 1897; inherited by his sister Alice de Rothschild (b.1847, d.1922); inherited by her great-nephew James de Rothschild (b.1878, d.1957); bequeathed to Waddesdon The Rothschild Collection (The National Trust) in 1957. Roger Portalis, Henri Béraldi; Les graveurs du dix-huitième siècle (1880-82); 3 vols; New York; Burt Franklin; 1970. vol. 2, p. 497. From the late 1730s the engraver François Jouillain gave up engraving for his business selling prints on the quai de la Mégisserie. His son, F. C. Jouillain, active from around 1760, applied himself to the business, and supplied expertise in selling prints, paintings and curios. He continued the family business after his father's death in 1778. Maxime Préaud; Dictionnaire des éditeurs d'estampes à Paris sous l'Ancien Régime; Paris; Promodis; 1987. pp. 182-83, on Joullain, father and son.